We are a company that strive to provide the best essence of Tea, to both local and global market. To gain such recognition among the majority, we have to standardize ourselves to keep the promise we have made to our worthy clients. 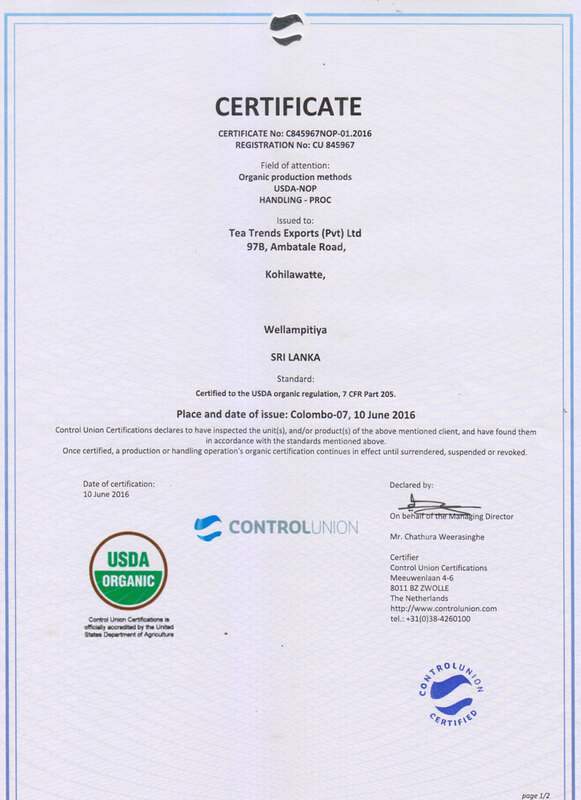 The following are our certifications that prove we are one of the best Tea manufacturing companies in Sri Lanka, which offers finest the tea blends for your delight. Control Union is a global network of inspection operations and dedicated laboratories. Independent worldwide cargo surveying and superintendence. Through innovative solutions, specialised services and product knowledge, we offer complete packages for logistics, quality and quantity management. From the country of origin to the final destination. And with an open mind towards clients’ demands. The standard introduced to the business world in 1998 by the BRC and presently has standardised 17,000 certificated sites in 90 countries across the world. 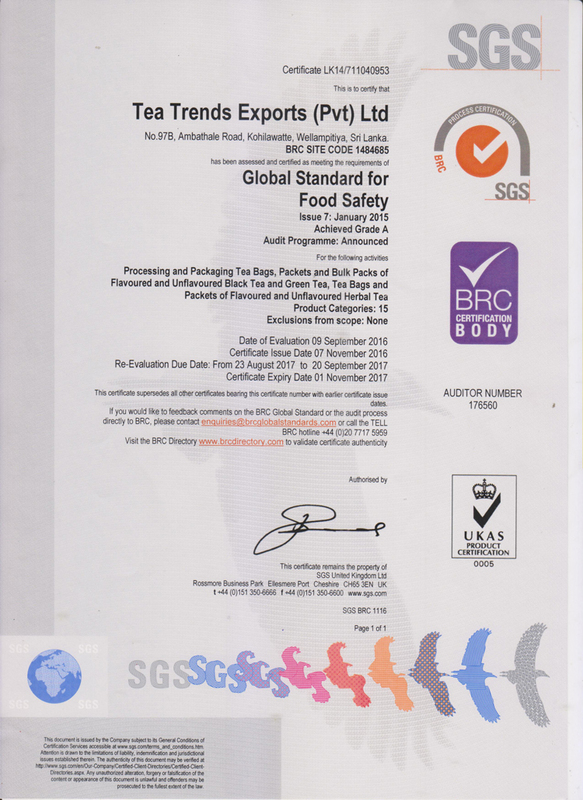 Tea Trends Exports has been standardised by Global Standard for Food Safety – issue 06 which has increased emphasis on good manufacturing practices, including a change in the balance of the number and depth of necessities in favour of the execution of good manufacturing systems within the factory and greater focus on standardising best practices for auditing the Standard. Hazard analysis and critical control points, or HACCP, is a systematic precautionary methodology approach for food safety and allergenic, chemical, and biological hazards which may arise in production processes that can lead to an unhealthy and unsafe end product. HACCP also schemes various standardised measurements to reduce these risks to a safe level. Tea Trends being certified by HACCP refers that the company prevents any causes that might lead to hazards during production process and ensures from the beginning that the process is secured and guarantees a safe product. ISO 22000 is a standard established by the International Organization for Standardization dealing with food safety. It is an overall derivative of ISO 9000. The ISO 22000 International Standard identifies the necessities for a food safety management system that comprises, Interactive communication, System Management, Prerequisite Programs and HACCP Principles. Communication along the food chain is vital to certify that all appropriate food safety threats are recognized and sufficiently measured at each stage within the food chain. This indicates communication among organizations both upstream and downstream in the food chain. Communication with consumers and dealers about recognised threats and control actions will support in expounding consumer and dealer necessities. Tea Trends being certified by SLSI ISO 22000 states that the organisation foils any roots that might lead to threats during production process and confirms from the foundation that the progression is protected and assurances a safe product. Good Manufacturing Practice standard delivers regulation for manufacturing, testing, and quality assurance in order to certify that manufactured goods are harmless for consumer ingesting. 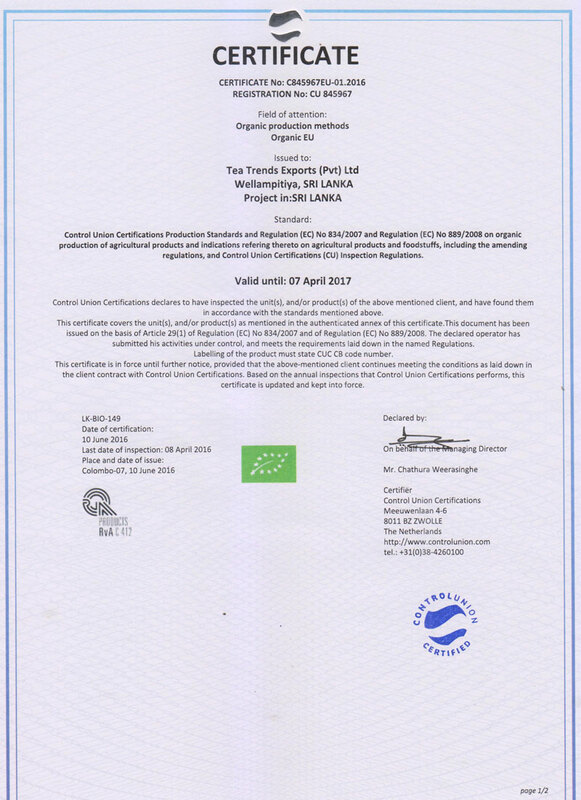 Tea Trends being certified by Sri Lanka Standards GMP Certified Institution states that the organisation foils any roots that might lead to threats during production process and confirms from the foundation that the progression is protected and assurances a safe product. Being a responsible trader and an exporter in the Sri Lankan economy, we are an established organization that is registered with the following authorities, to carry out trade practices in line with the government and business protocols which are necessary. Ceylon Chamber of Commerce – Ceylon Chamber of Commerce functions as an effective spokesman of the business sector of Sri Lanka. The members of Ceylon Chamber of Commerce serve on various institutions and committees set up by the Government as well as the private sector, either as Chamber nominees or in their personal capacities to identify key issues to assist in the development of strategic plans to meet new challenges and opportunities of the economy. National Chamber of Commerce of Sri Lanka – The National Chamber of Commerce of Sri Lanka (NCCSL) was founded in 1948 soon after Sri Lanka gained independence from British colonial rule, primarily to establish a forum for the Sri Lankan business community. The foremost objective of the Chamber at that time was the Ceylonisation of trade, as the policy climate was not quite conducive to national interests. The Founder Members comprised of all leading ethnic groups, Sinhalese, Tamils, Muslims, and Burgher. In 1955, the Chamber was formally incorporated as a Company Limited. To be a globally recognized brand that present benchmark tea assortments, for ultimate client satisfaction. While offering our loyal customers a stimulating cup of tea that is both refreshing and healthy, we will be constantly engaging ourselves in research and development to find alluring flavours to satiate our growing faithful customers, according to internationally recognized standards.